The NIH recently released information regarding a new Clinical Trial for people with LFS. The Trial(#NCT01981525) uses Metformin, a drug traditionally used to treat type 2 diabetes. Information on the trial can be found here. 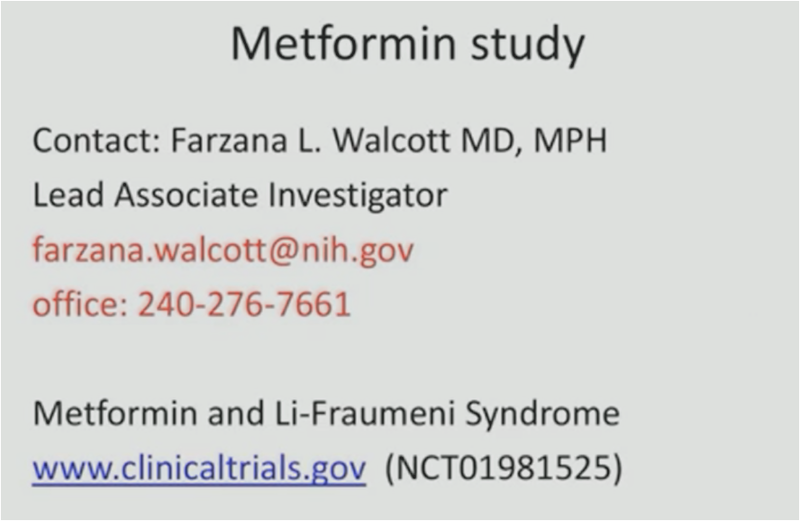 In this Metformin Trial, researchers are looking for 36 adults(over the age of 18) who have a documented germ line p53 mutation. These participants will be given Metformin for 8 weeks and be evaluated during that time for effectiveness. Evaluation includes blood tests to check the levels of certain biomarkers to determine if Metformin has an effect on them. 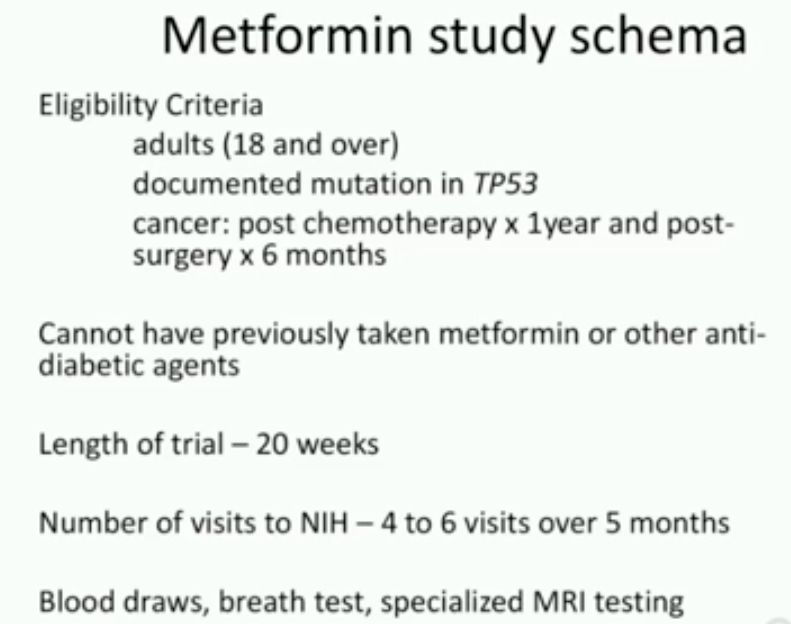 This phase of the trial will not evaluate Metformin and cancer. Clinical Trials have 3 phases. The first phase, which the Metformin Trial is in- merely administers a medication to determine safety. During phase 1 trials, researchers give a drug to a small group of subjects to see if it is safe, has any side effects and determine dosage that is tolerated the best. Phase 2 trials include a larger group of subjects and test to see if the medication is still safe in a greater number of people and begin to look at how effective it is. Some people in phase 2 studies will get a placebo(dummy pill) so that researchers can adequately gauge effectiveness. Phase 3 studies include larger numbers of subjects and are used to collect more data on the safety and effectiveness of the medication as well as compare it to currently used treatments. Clinical Trials are a regulated process to test the safety and effectiveness of new drugs, or in the case of Metformin, a new use for an existing drug. The Trial process can take many many years. Metformin has been around for almost a century, first created from French Lilac in the 1920’s to help manage diabetes, it was put aside once insulin took the stage. Decades later, in the 50’s the French began clinical trials and Metformin eventually became widely used in Canada, the UK and in the US during the mid 90’s to treat type 2 diabetes. In 2007, researchers noticed that Metformin helped selectively starve cancer cells that did not have functioning p53. In 2008, MD Anderson began clinical Trials using Metformin in breast cancer treatment and began poring over data collected from diabetics on Metformin. They found that Metformin significantly reduced the risk of pancreatic cancer in these populations and further studies revealed that it was even more effective as treatment in combination with other chemotherapies. Recent studies revealed p53 as a player in energy metabolism, not just tumor suppression. This makes sense if we think in a broader picture of how cancer works. Cancer cells are multiplying with abandon, to do so, they need extra sources of energy. What’s a great source of energy- simple carbohydrates- sugar! PET Scans make use of this concept by injecting radioactive glucose and using a CT to visualize the uptake. The theory is that cancer cells need the sugar and take it up faster than normal cells- hence lighting up on the scan and indicating a potential cancerous growth. P53 has a complex relationship with the different energy pathways involving insulin and glucose metabolism. P53 marks cells during time of starvation(less energy being supplied) so that when there is less nutrition for the cells, less errors are made during replication. This makes sense- ever notice how you don’t think as clearly when you are hungry? The body goes into survival mode. I’ve even had cancer patients notice that they craved sugar a lot right before a cancer diagnosis. When we eat- our body sends out a bunch of signals to different cells, starting different actions that determine where the nutrients go. Cancer cells are continuously replicating and “starving” for sugar. Insulin is made by the pancreas and when the body decides if it needs to use or store the sugar, insulin helps sugar get into cells. Juvenile, or Type 1 diabetes is a condition where the body does not make insulin. Insulin has to be provided to help sugar get into cells. Type 2 diabetes, which is very common in the US and the type of diabetes that Metformin treats is also called insulin resistance. Over time, the cells stop recognizing the insulin and sugar cannot be transported into cells. 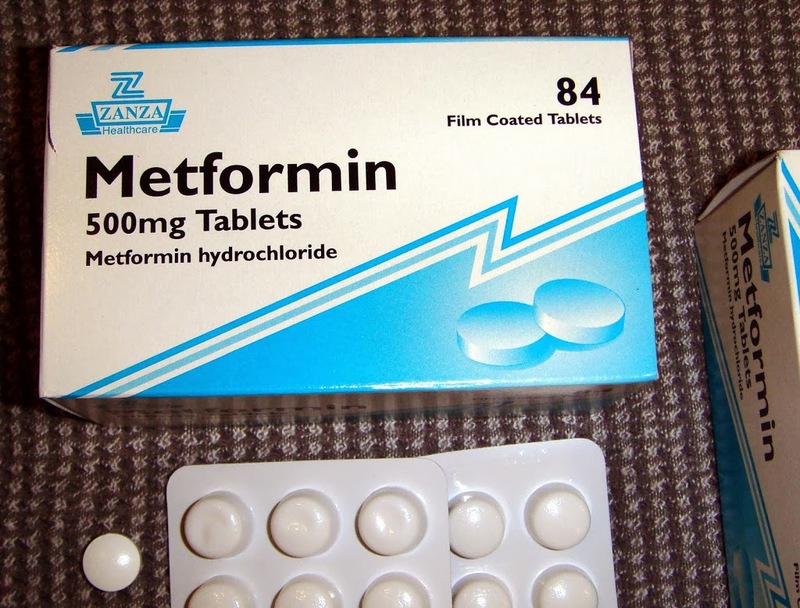 So what does Metformin do? Metformin decreases the amount of sugar made in the liver. Metformin also helps the body use sugar and recognize the insulin receptors again. The exact mechanisms of Metformin aren’t understood, but as researchers learn how it works, they get a better understanding of how the body uses sugar and how cancer cells use sugar. For years, doctors and scientists have touted a healthy diet and reducing sugar intake as a cancer preventative, now they are getting a better idea of how this happens. Once scientists found that p53 is active in mitochondria and energy pathways- they began closing the loop that links Metformin to p53. When LFS mice were put on metformin, they grew less tumors. Metformin is pretty well tolerated and generally has few severe side effects. Metformin can cause a deficiency in vitamin b12(linked to anemia), but that can be monitored through blood tests and balanced with supplements or increased diet intake of foods high in b12(shellfish, fish, liver, beef, poultry). Other side effects include gastrointestinal distress, weight loss and a condition called lactic acidosis. Lactic acidosis occurred with Metformin’s predecessors, but is not as prevalent with Metformin. It can still happen and severe onset of diarrhea, vomiting and abdominal cramps should be investigated. So while the idea of Metformin and p53 is very promising, it is in the beginning stages. There is no magic bullet and Metformin will not cure LFS. It may help delay cancer or find a way around malfunctioning p53- only time will tell. These clinical trials are important for folks with LFS and could be an important stepping stone towards the arena of living longer and cancer free with LFS.